Kingdom Hearts III is an overwhelming melting pot of Disney cheer and anime excess. The franchise has previously included Square-Enix characters, and while they don’t make an appearance here, the game does include an extended gag trailer that pokes fun at the series’ direction and potentially teases what’s to come. Kingdom Hearts III shows a lot more self-awareness than previous entries and even pokes fun at some of its own conventions. Early on, the game showed a title card referring to the opening segments of the game as Kingdom Hearts 2.9, which was a fun bait and switch for players who thought they were finally playing Kingdom Hearts III (the title card for that shows up later). The title card also riffed on the numerical stylings of other series titles, like Kingdom Hearts HD 2.8 Final Chapter Prologue. The game’s biggest moment of meta-awareness comes in the introduction of the Toy Story-themed world, which features a faux-advertisement for a game that brings to mind the troubled Final Fantasy Versus XIII. The reveal of this fictional game within the world of KHIII also sets up a surprising (and confusing) reveal in the secret ending. When the player first arrives at the Toy Box world, they’re treated to a fake television commercial for a video game called Verum Rex. 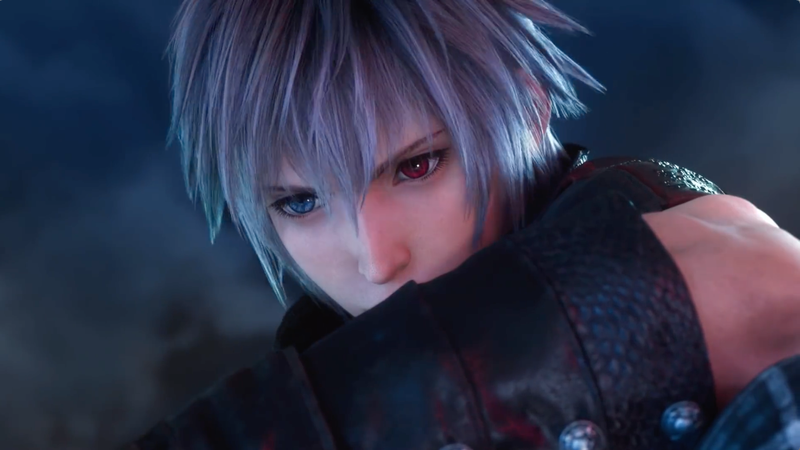 The hyper-stylised trailer is made up of highly detailed full-motion video and shows a silver-haired hero fighting in a modern city, battling giant robots alongside some familiar looking bros. One of these bros is a red-haired pretty boy who seems a bit like Final Fantasy XV’s Prompto, while another bespectacled pal looks a lot like Ignis “I’ve Come Up With A New Recipe!” Scientia. In the trailer, the heroes are shown to be attempting to rescue a magical maiden. The scenario looks like a jumbled mix of elements from the ill-fated Final Fantasy Versus XIII, a project which Kingdom Hearts III director Tetsuya Nomura directed and which eventually became Final Fantasy XV. The girl in the trailer even looks like Stella Nox Fleuret, a female character featured prominently in trailers for Versus XIII who was later replaced with the slightly more demure Lunafreya Nox Fleuret. They even make the Verum Rex protagonist Yazora slouch on the box art in the same position that Noctis does Final Fantasy XV key art. At first, it’s not even clear that this trailer for Verum Rex is taking place within the world of Kingdom Hearts III. When the commercial ends, the cutscene continues, revealing that Rex from Toy Story was watching it on TV. But the Verum Rex trailer’s extreme detail left me, my coworkers, and many Kingdom Hearts fans wondering what was up. It would make sense for Nomura to sneak an over-the-top reference to his time working on Versus XIII and Final Fantasy XV into Kingdom Hearts III. The project was in development for over a decade, releasing under the direction of Hajime Tabata once Nomura left to work on Kingdom Hearts III. But Verum Rex also comes crashing back in the game’s hidden ending, which players can unlock by finding enough lucky emblems. The secret ending features Sora and Riku walking around a modern city which appears to be Tokyo, since it also features the iconic 109 department store found in Shibuya. By itself, this could trigger a lot of speculation. Are they in the modern world? Have they crossed over into The World Ends With You, even if that game has a 104 building and not 109? Kingdom Hearts fans have been speculating about secret endings ever since the first game’s “Another Side, Another Story” video. What makes this new video stand out is a peculiar character: the hero from the Verum Rex trailer, Yazora. What the hell is he doing here? If you’ve played through the Toy Story level, you will recall that when the Toy Story crew meets Sora, they assume he is an action figure from Verum Rex. When Sora, Donald, and Goofy see the Verum Rex box art, they acknowledge that Sora does look a bit like Yazora, the game’s hero. But Yazora also looks a lot like Riku. Later in the Toy Story world, Sora gets chucked into a television and into the world of Verum Rex for a few minutes. He has to endure an extended robot battle against waves of enemies before he can escape the world of Verum Rex and return to his new Toy Story friends. After defeating that initial Verum Rex level, players can head back in and play it again if they want to get a high score. None of the characters from the trailer pop up, though. This whole setup invites a lot of questions. Where do Sora and Riku exist, exactly? The real world, inside the Verum Rex video game, in an actual world with Yazora and his buds? I have no idea, but Kingdom Hearts special endings do tend to set up characters and motifs that will then appear in future Kingdom Hearts games. Maybe Yazora will play a part in whatever comes next, whether that’s a future Kingdom Hearts, or a real-life Verum Rex game. Maybe Nomura’s produced the most expensive joke in the history of forever. It’s hard to say, but I do know that if Verum Rex was real, I’d definitely play it.